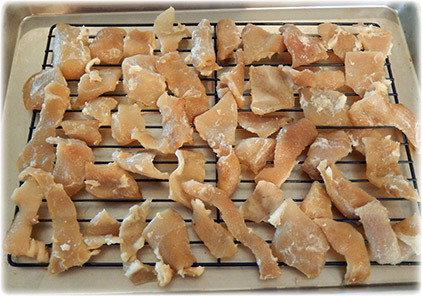 You might not know that pork rinds are a healthy snack, but according to some Paleo diet experts, they are. 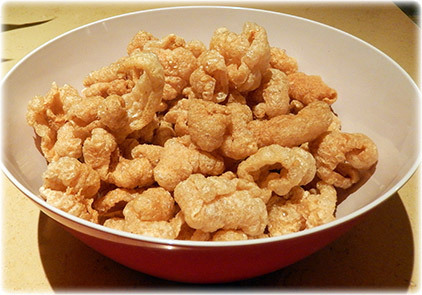 Pork rinds have zero carbs, zero glycemic impact, are brimming with protein (albeit technically an incomplete protein) and absolutely loaded with vitamin D, glycine, and healthy monounsaturated fats (when cooked in healthy lard). But here's the catch --- the pork rinds need to be from healthy outdoor-raised pigs. There is a world of difference between a conventional barn pig and an organic pig that's been raised outside. Pigs function as food-concentrators, and therefore everything they eat, breathe and drink will become concentrated in their tissues. That is a good thing, but only if the pig has been eating healthy foods and living outside. 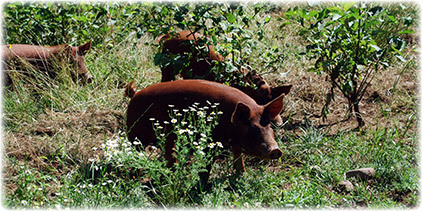 Pigs are meant to live outside and forage on roots, grasses, seeds, bugs, brush, berries, and so much more. When they are allowed to live this way, they'll provide gorgeous monounsaturated healthy fats which are drenched in vitamin D and an abundance of other essential nutrients. Plus they'll provide prodigious amounts of collagen-rich tissue which, when rendered, becomes a powerhouse of super-healthy gelatin / glycine. What more could we ask of these amazing creatures? 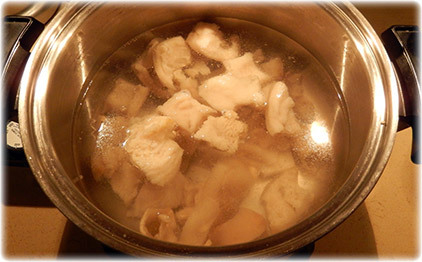 Many of you know that bone broths are an excellent way to nourish your bodies and achieve certain health objectives. Bone broths when made correctly are very high in gelatin which works in tandem with other nutrients to deliver the nourishment and healthy building-blocks your body needs for recuperation and proper immune function. But did you know that broths can be enhanced by adding pork-skin to them? This is because of the skin's incredibly-rich collagen stores. You might be saying "Why the big deal about gelatin? Isn't it an incomplete protein?" It is true that it lacks an essential amino acid and therefore is incomplete for the purposes of building lean tissue (although there's no reason you can't stack it with a complementary food source to compensate for this). But building lean tissue is just one comparatively minor element of good health. Longevity is important, immune health is important, sleep is important. There are many aspects to health, and it turns out gelatin (and in specific glycine, the major component of gelatin) is very beneficial --- as many bone-broth fans will agree. So should you start loading up on pork rinds, which are of course entirely derived from skin and filled with gobs of highly bio-available glycine? Some say "Yes!" but again, only if your source of pork skin is organic, humane, soy-free, and as pristine as possible. 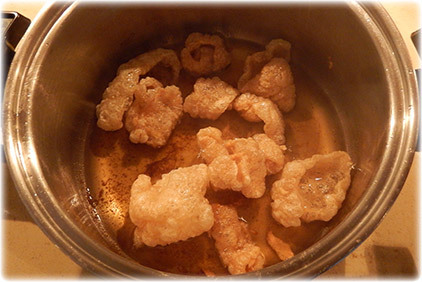 I recently decided to try making pork rinds and found it surprisingly easy. And incidentally they're delicious and fun to eat. Here's a recipe I adapted from Bacon's Heir. Step one is to get the organic pork skin which of course you can buy from our farm. This is relatively cheap and when you see the amount of pork rinds you can make from a fairly small bag of skin, Wow! You'll need to cut the skin into smaller pieces of around an inch or two in size. It doesn't matter the shape, and it doesn't matter if the sizes vary a lot. But your knife needs to be very sharp. Step two is to place the pieces of skin into a pot of water and gently boil for no more than an hour, being sure to add water so it doesn't boil dry. Turn on the kitchen fan if you have one, as it gets steamy. Step three is to drain-off the water and let the pieces of skin cool. 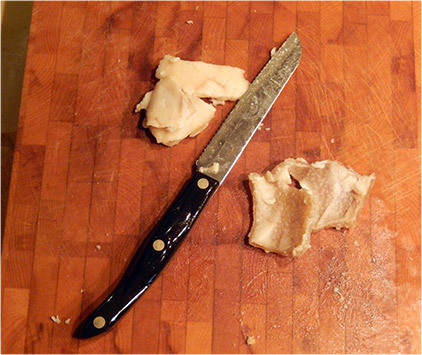 Then take each piece of skin and use your sharp knife to scrape the fat from the skin. You don't have to get the skin perfectly free of fat, but the more thorough you are, the better the rinds will turn out. And what should you do with the fat? It's perfectly good as a lard-source, you can render it down sometime later and cook with it. Once you've scraped the fat off the skin, you're almost ready to start the fun part. Step four, get a cooling rack (or several cooling racks) and lay-out the skin being careful that none of the pieces are touching. Put the racks into the oven at around 180 degrees and if your oven has a convection fan, turn it on. You're going to be dehydrating the skin. Keep the oven going for at least eight hours. The skins will be hard when they come out. Step five, get two or three cups of lard (if you haven't rendered lard before it's easy, here's how) and put it in a saucepan, heating it to about 350-400 degrees. Careful it doesn't splatter on you. 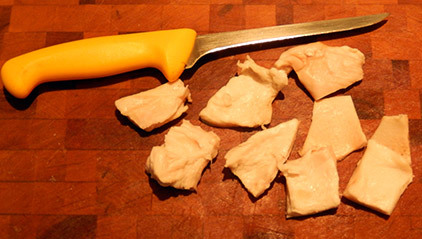 Then gently add a few (say 5 or 6) pieces of skin into the hot lard. Watch them puff up like popcorn! It only takes a few seconds (say 10 or 15) and they're done! Take them out and put them on the cooling rack and liberally shake-shake-shake your seasoning salt all over them while they're still very hot. Then move them onto some parchment paper to cool down. Meanwhile add another few pieces to the hot lard and keep repeating this process until complete --- it doesn't take very long. 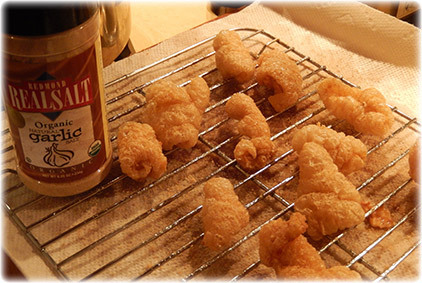 Soon you'll have an assortment of tasty pork rinds which are healthy, fun, impressive, and delicious! They especially make a nice treat for a special occasion where you want to put out some healthy snacks rather than the standard potato chip bowl. Plus the presentation is so delightful. 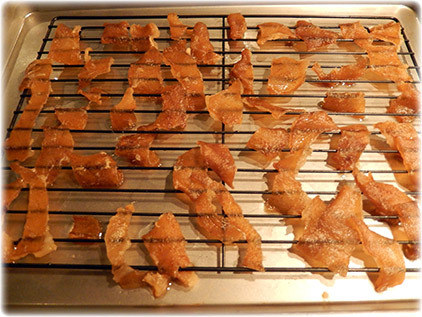 And now you have delicious, healthy pork rinds!